A self portrait by Mabel (or May) Grigg, artist and printmaker. Signed by the artist ["May Grigg"], bottom right corner. 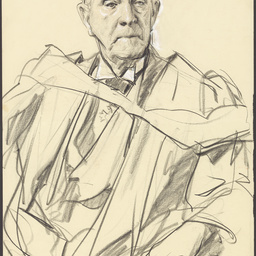 Drawing by artist Ivor Hele of Sir Norman Giles, Chairman of Elder Smith Goldborough Mort. This was a preparatory sketch for an oil painting portrait, done at Aldinga, South Australia. 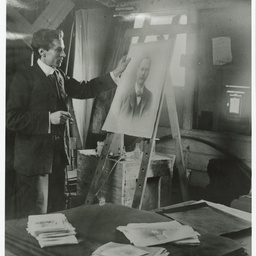 [See B 70791A for a photograph of the finished portrait.] Charcoal drawing on wove paper with white conte highlights. Signed 'Ivor Hele' in charcoal on lower right. [General description] Upper body portrait of Charles Birks, Draper, in three quarter view. He wears his hair short and a has a trimmed beard. 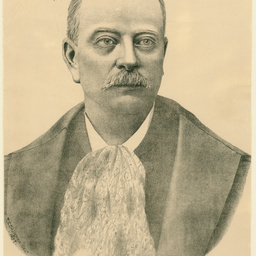 He was the founder of Charles Birks' department store in Rundle Street. 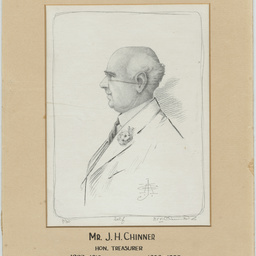 A limited edition lithograph (7/30) of a self portrait of John Henry Chinner in profile. On the mount is 'Mr. J.H. Chinner / Hon. 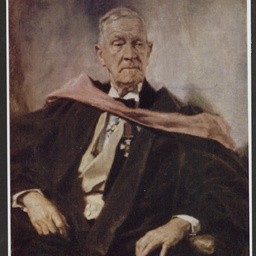 Treasurer / 1903-1910 / 1928-1933' (with no indication of which organisation he was working for). NOTE: original has been damaged with a line across the face. 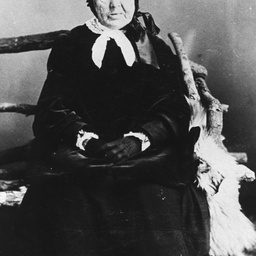 A black and white studio portrait photograph of a woman sitting in an ornate chair. Four ambrotype portraits and one daguerreotype portrait, gilt-framed in velvet-lined cases, of people believed to be ancestors or family of William James Isbister (1866-1950). None have been identified. See below for details. Six studio portraits, including one of Caroline Haycraft taken August 1897, and another labelled M.M. Haycraft. Portrait in oils of John Chinner, seated in an armchair, by J. Cheney, painted in England in 1840. Signed and dated in red near middle bottom third of painting. 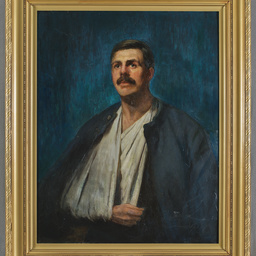 A portrait in oils of Ralph Elesmere Claridge by George J. Coates, which he titled 'For the Empire : a wounded Anzac'. 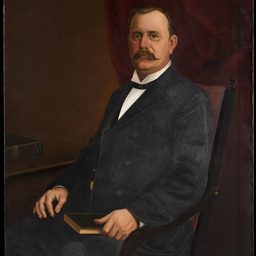 A portrait in oil by F.R. Burford. 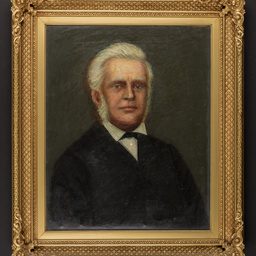 By comparison with a known work by the same artist in 1893, the portrait appears to be of the artist's father, William Burford (1845-1925). 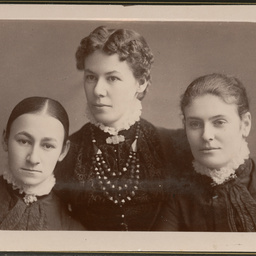 Album containing portraits of Meyer and Lovelock family members. Kelly, Genery, Herbert, Polhill, Sanders, Clayton, Ramsay, Gerrard and other families are included. Some families appear to be from the Yankalilla area. It is not known who compiled the album. To view images, take the Browse Album link. 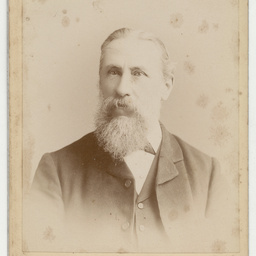 The album provides examples of carte-de visite and cabinet portraiture of many Adelaide photographers of the 1870s to 1890s, as well as good examples of the clothing and dress fashion of the day. The photographers are noted in brackets after the caption, where they are known. Photograph 26 shows a person in military uniform with a distinctive pill box cap, possibly the uniform of the Mounted Volunteer Corps of the Volunteer Militia. The album has a hand sewn cream suede cover, with rudimentary embroidery done in an acorn and leaf pattern. 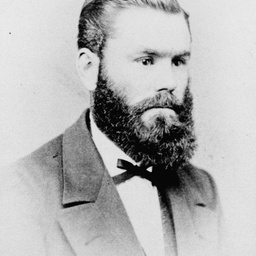 Additional research was carried out by Anthony Laube, who believes the album probably belonged to Mrs Lovelock. His additional information is shown in square brackets. 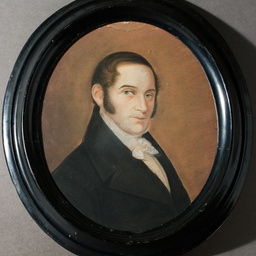 Portrait of Captain Dirk Meinerts Hahn painted by Hugo Carstensen. Framed in black moulded oval wooden frame. 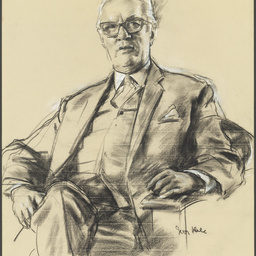 Drawing of Mr Hallett by artist Ivor Hele. This was a preparatory sketch for an oil painting portrait, done at Aldinga, South Australia. 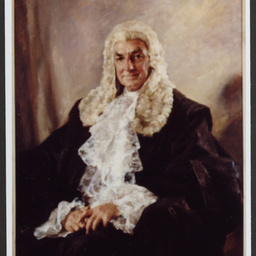 (See B 70789A for a photograph of the finished portrait.) 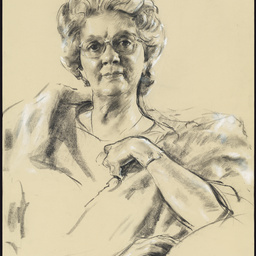 Charcoal drawing on paper, with details defined in pencil and with white conte highlights. Signed 'Ivor Hele' in pencil on lower right. 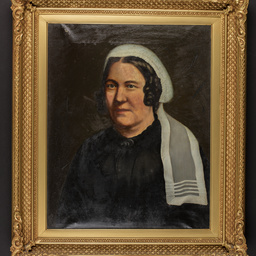 PORTRAIT: A studio portrait of an elderly woman believed to belong to the Folland Family. 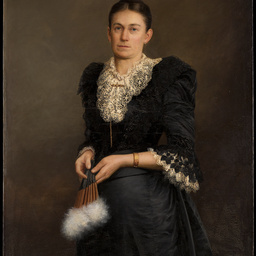 Portrait of early colonist Mary Burford woman wearing a lace trimmed black dress and holding a feathered wooden fan; an oil painting, unframed, signature 'Carl Friström' and date 1894 in bottom left corner. 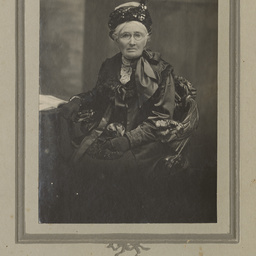 According to a family researcher, the woman is Mary Burford (nee Richardson), born 1845 and died 1921. 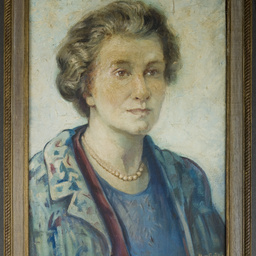 She was the wife of William Burford (see portrait B 56297) and mother of the artist Frederick Rumsey Burford. Portrait photographs taken of famous photographer Harold Cazneaux at various stages of his adult life. See 'contents' for details of items. 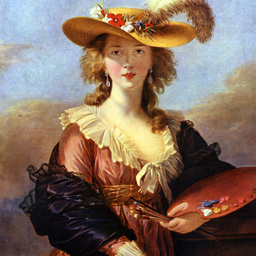 Coloured reproduction of 'Portrait of the artist' by French portrait painter Elisabeth Louise Vigee-Lebrun held in the National Gallery, London. 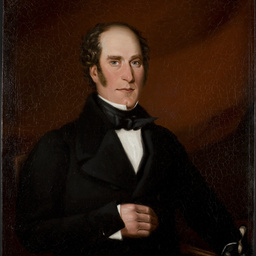 Portrait of an early South Australian settler, Charles Flaxman, by an unknown artist. The oil painting is mounted in an ornate gold frame, and is a pair with a portrait of his wife, Jane Flaxman (B 76988). Portrait of an early South Australian settler, Jane Flaxman (nee Bell), by an unknown artist. 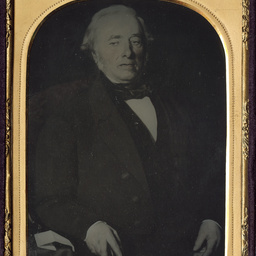 The oil painting is mounted in an ornate gold frame, and is a pair with a portrait of her husband Charles Flaxman (B 76987). 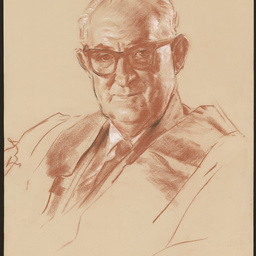 Portrait of John C. Bray, signed and dated by the artist, and carrying a handwritten inscription 'Yours Truly J. C. Bray'. 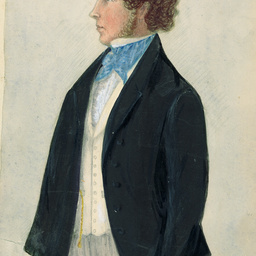 Self-portrait in watercolour by George Williams Chinner, painted in 1845. Signed 'GC 1845' in pencil at bottom right corner. This may have been painted during the voyage of the 'Templar' to South Australia. 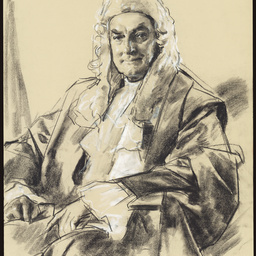 Drawing of William (Bill) Wills by artist Ivor Hele. This was a preparatory sketch for an oil painting portrait, done at Aldinga, South Australia. Sepia conte drawing on paper, with charcoal highlights. Signed 'Ivor Hele / 69' in charcoal on lower right. 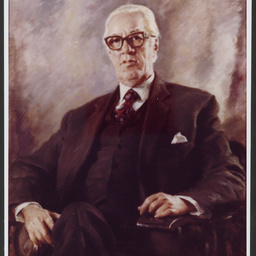 Photograph of an oil portrait of Sir Simpson Newland by artist Ivor Hele. This image complements the preparatory sketch done by Hele (see B 70786). 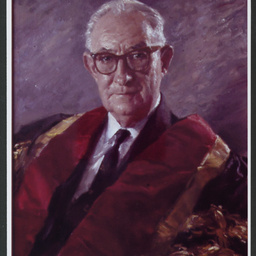 Photograph of an oil portrait of Dr M.E. Chinner by artist Ivor Hele. This image complements the preparatory sketch done by Hele (see B 70787). 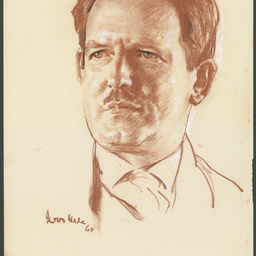 Photograph of an oil portrait of Sir Condor Laucke by artist Ivor Hele. This image complements the preparatory sketch done by Hele (see B 70788A). 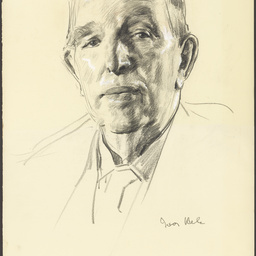 Photograph of an oil portrait of Sir Norman Giles by artist Ivor Hele. This image complements the preparatory sketch done by Hele (see B 70791).